Rhonda Vincent And the Rage were happily surprised to hear that they received a dozen nominations for the The Society for the Preservation of Bluegrass Music of America (SPBGMA) Awards scheduled to take place next month in Nashville. The Society for the Preservation of Bluegrass Music of America (SPBGMA) is a regular favorite for bluegrass fans and artists. The Midwest Convention and Awards are the last SPBGMA event prior to the National Convention which will be held in Nashville, Tennessee from January 31st through February 3, 2013. The winners of the Midweest Awards are listed below. 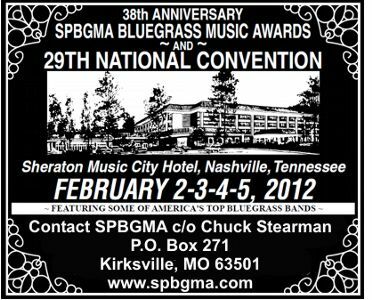 The Society for the Preservation of Bluegrass Music of America (SPBGMA) will hold their 239th National Convention and the 38th Anniversary Bluegrass Music Awards February 2-5, 2012. The four-day event will be held at the Sheraton Music City Hotel in Nashville, Tennessee, just south of Opryland USA. The convention and awards show will also feature a banjo workshop and a national promoters meeting.